t’s rare to come across a laptop that is as suitable for young users as for businessmen who are over 50. ACER ASPIRE V3 571 G certainly is one of those. 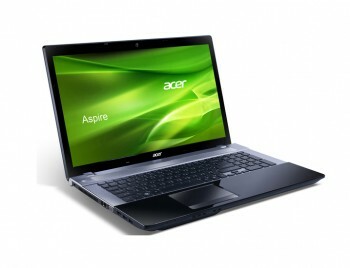 The design has the classic look previously imposed by the Acer Aspire line. The only differences we found were at the circled parts right next to the opening hinges and the angled lining of the keyboard. It weights 2 kg 600 grams with the battery included. The main material used is plastic with several types of treatment including a glossy finish. And unlike many of that kind its difficult to stain and does not attract fingerprints. There is also metal used but mainly for decoration. The display is a LED backlit with a diagonal of 15,6″ and HD Ready resolution of 1366 x 768 pixels. The display is a LED backlit with a diagonal of 15,6″ and HD Ready resolution of 1366 x 768 pixels. And although the 517 G is meant to be a business computer it has a wide viewing angle. In the upper part of the display we find the built-in HD WEB cam and mic and going through the tight opening mechanism we get to the keyboard. But first we should mention the integrated Dolby Home Theater sound system. It consists of two stereo speakers with 1.5W power each. The sound comes out through the whole length of the panel and even at the volume at maximum there was no distortion and it is strong enough for you to watch a movie without the need of extra speakers.At the periphery we find a total of 3 USB ports, two of which the new and 10 times faster v3.0. There are also VGA and HDMI ports, along with a 3 in 1 card reader. The optical devise is a combined DVD Super Multi. The keyboard we mentioned is really comfortable and has island style located keys. The touchpad is located slightly to the left and has a glossy finished frame, so be careful with watches, bracelets and other metal objects. Acer Aspire V3-571G has a really good hardware. A 4-core Intel Core i7-3610QM processor with a 6MB L3 Cache. As a typical business laptop, Acer Aspire V3-571G has a really good hardware. A 4-core Intel Core i7-3610QM processor with a 6MB L3 Cache. Each core is running at 2.3MHz, but with the Turbo Boost it they could reach 3.3GHz. Ram memory itself is enough – 8GB DDR3 at 1333 MHz. It also has a NVIDIA GeForce GT 640M with 2GB memory of its own. And the hard disc has the absolutely enough for standard user needs 750 GB SATA with 5400rpm.